Crews rolled in tires at the 2017 Northumberland Association for Progressive Stewardship Creek Cleanup. 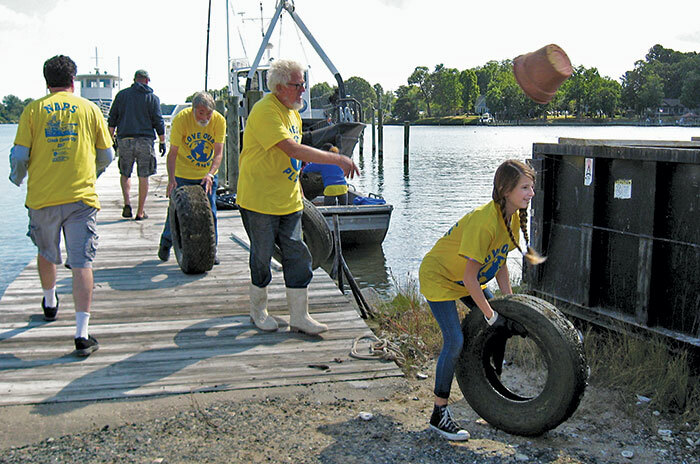 HEATHSVILLE—Sporting bright yellow “Love Our Planet” t-shirts some 40 participants, including Northumberland students, boat captains, Smith Point Sea Rescue crew and on-shore volunteers, on October 1 collected hundreds of pounds of trash from creeks along the Little Wicomico River. Cockrell’s Marine Railway serve as the base of operations for the 2017 Northumberland Association for Progressive Stewardship (NAPS) Creek cleanup. Lynton Land coordinated the captains, including Monty Deihl, Andy Cockrell, Myles Cockrell, Bill Anderson, Wayne Corey, Bob Yinger and Adam Wood. NAPS president Mike Ahart did a great job of organizing the entire event, said Land. After lunch sponsored by Omega Protein, boats set out with crews of students and adults, including many fifth-grade Talented and Gifted students and Beta Club members. Each boat had creeks assigned from special charts provided by NAPS. Two of the boats made second passes at the debris dumped in the creeks. As a safety precaution, a four-man crew from Smith Point Sea Rescue stood by on its 42-foot Provincial Rescue. As the boats off-loaded the trash, the on-shore volunteers sorted the recycle items such as bottles and cans. The heavy items, rusty crab traps, plastic furniture, old tires and most of a TV receiver, went directly into a large dumpster. Student volunteers included Namiyah Andrews, Chloe Brann, Olivia Byrd, Victoria Douglas, Izaak Hagy, Reagan Harding, Cooper Haynie, Anna Jett, Kelsey Moss, Olivia Newsome, Kimberly Palka, Anna Pridgen, Ashley Roberts, Joey Rockson, Hallie Shackleford and Ava Wilson. “These children are very motivated and beach cleanup is this year’s goal. You could see the satisfaction they felt,” said NAPS board member and TAG program coordinator Shauna McCranie.